Would you like to add "Award winning PR firm" to your masthead? Have you done some great not-for-profit PR work lately? Do you want the world to know about it? 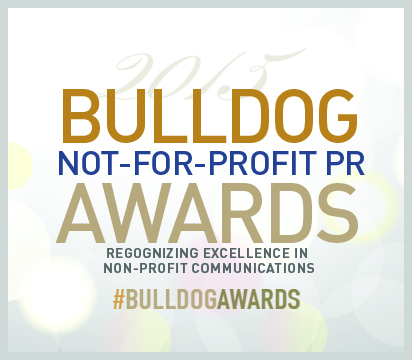 The Bulldog Not-for-Profit PR Awards are open for submissions with multiple categories to enter. Remember the more categories you enter, the higher your chances of a win! Our Grand Prize winner is always a multi-category award winner. For 2015, we are pleased to present our Grand Prize winners with a beautiful crystal bulldog award, custom etched with your organization's campaign details. If you entered a submission into the Bulldog Corporate Social Responsibility PR Awards program, we will be announcing the winners in mid June. We'll keep you posted! We received hundreds of submissions for the Bulldog Media Relations Awards! We expect to release the winners names by mid July--- stay tuned! For all the details on these programs and to enter your winning PR submission, please click here. We look forward to receiving your submission and presenting you with a 2015 Bulldog Award.